With it’s sharp tart taste, it adds life to just about anything you throw it on. Like lemon it balances sweet flavors really well. So sad that it disappeared from cooking for a while, but boy are we glad that its back! Sold at the peak of freshness. Our sorrel is grown and sold to be used right away for the best flavor. Our fish and salads have never been the same. 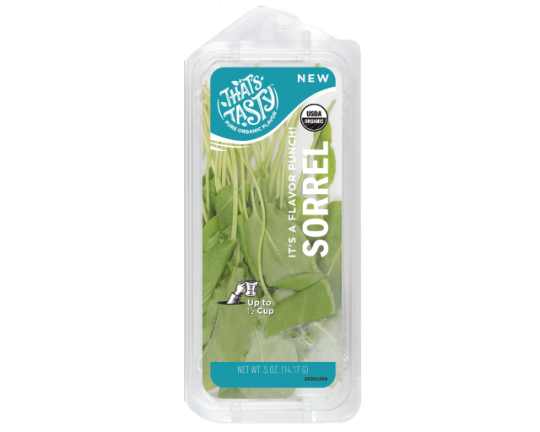 Sorrel is happiest inside its package, hanging out in your refrigerator drawer. Sorrel should last a week. Like lettuce, sorrel will start to look wilt and brown when it starts to go bad. Freeze pureed sorrel in ice cube trays with a little olive oil. These little favor bombs are perfect to quickly add flavor to fish, chicken or vegetables. Just drop a few in the pan before you roast or cook in the crockpot. It’s also great to use as a marinade. Add some to your water for a light lemon-y flavor. It’s always easier to get our 8 glasses of water, if it tastes great.